This husband and wife duo was inspired by the lack of good hot chocolate in America. 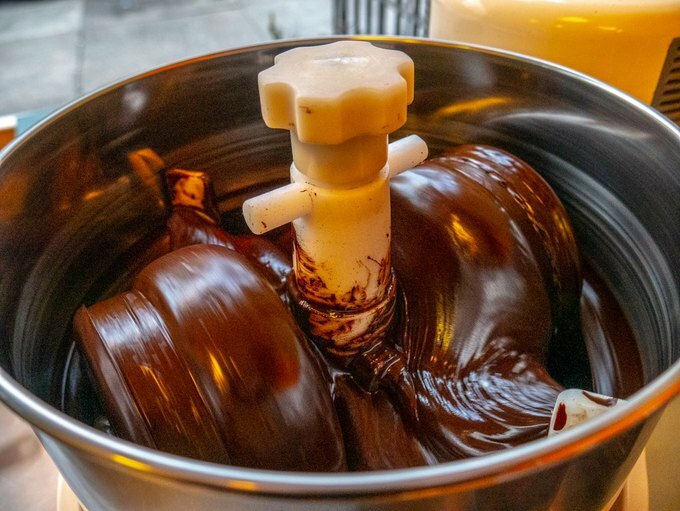 It was dark and freezing, and a few minutes past closing, but Constantine and Ruby Kalpaxis weren’t fazed—someone was here to learn about how they make chocolate. And teach they did: Constantine shuffled around their no-frills shop, Ridgewood Chocolate, for more than an hour, guiding me through each step of the meticulous two-day process. Ruby stood by the register, wrapping and double-wrapping pucks of chocolate in green-and-white paper, jumping in at the exciting parts. Constantine sprinkled in fun facts about cocoa beans, and the corporate chocolate industry, and the dangers of fructose corn syrup. His blue-gray eyes sparkled all the while. They spoke with such authority, such excitement, as if their shop, at 6002 Catalpa Ave., had been in business for decades. In reality they committed to making 70 percent dark chocolate just a few years ago, in 2016. “I have an analytical background; I’m laser-focused,” Constantine, 65, said. When he commits to something, he pores over each detail, consulting websites like Reddit and YouTube and good ol’ Google. 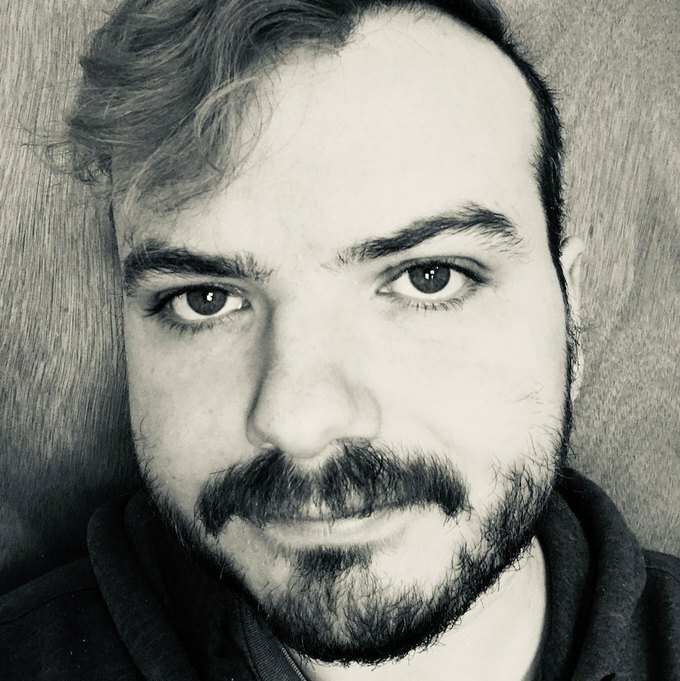 A former computer programmer, he once learned all about contract law and represented himself in court—and won his case against an employer who was cheating him out of money. It was the same with chocolate. A native of the Philippines, Ruby, 42, who wore a bright red lip, kept her hair under a net, snug under her glasses on top of her head, randomly reminisced about the hot chocolate of her childhood. Her neighbor used to roast cocoa beans, and she would help peel them. The hot chocolate in America, she said, was awful. The big-brand powders were made with milk powder, sugar, creamer, corn syrup solids — everything but chocolate itself. 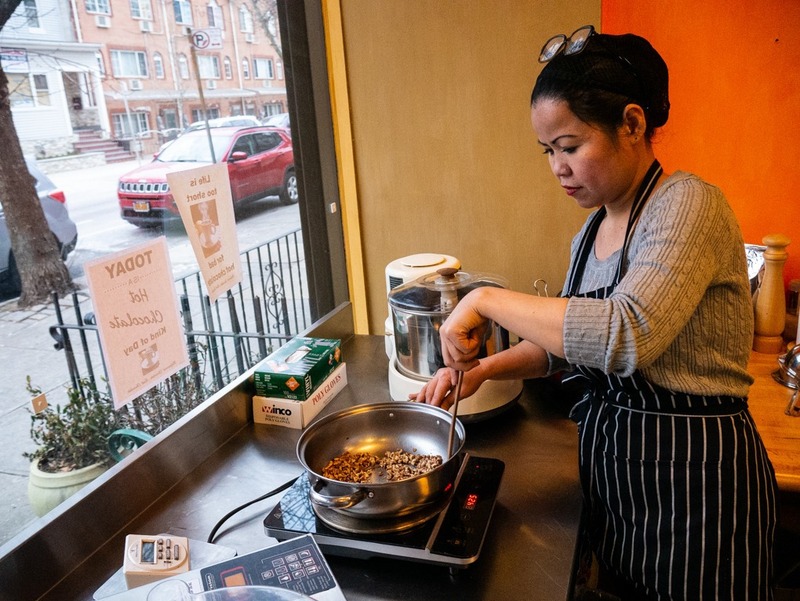 One day in July of 2016, she took a bag of cocoa beans she ordered weeks before on Amazon and put it through a corn mill they had meant to sell. After seven or eight times, it became pure chocolate, the consistency of toothpaste. Ruby called to her husband, who had sought refuge in their Ridgewood living room from the increasingly hot kitchen. And it was perfect timing. For 10 years, he and Ruby, owned American Hardware, a general store that sold pots, pans, table cloths, mason jars, cigarettes and of course, hardware. Business was decreasing with the rise of Amazon, and the couple was wondering what to do next. Ruby agreed to go into the chocolate business under one condition: She’ll make the chocolate, as long as Constantine sold it. 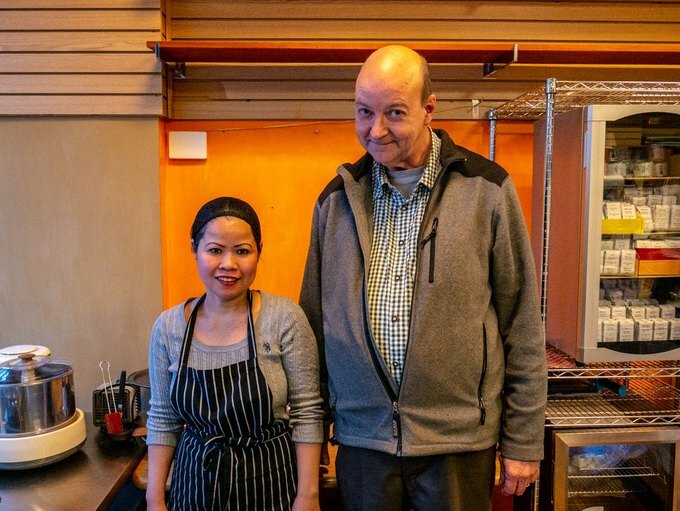 “I said, ‘Oh that’ll be easy — I’ll be able to sell it because I know it tastes so good,’” he said. It turns out that neither of them had the easier task. They opened in October 2016 with a focus, or rather an obsession, on quality, to make sure it was excellent. Half of the process happens at their home down the street from the shop, which still bears the bold green American Hardware awning. It still maintains the stark integrity of a general store, with knicknacks hidden in the back and the chocolate making and selling up front. There’s a wine fridge that keeps the chocolate cooling at a comfortable 60 degrees, and two intimidating little machines on the window sill. But with the aroma of beans from exotic locales, like Ecuador, Peru and Madagascar and the Philippines (when they can nab it), wafting throughout, there’s no doubt you’re in a chocolate factory. It’s just the two of them, Constantine and Ruby. Their 8-year-old chihuahua Cocoa, who was named well before they went into the chocolate business, spends most of her time snoozing behind the counter. 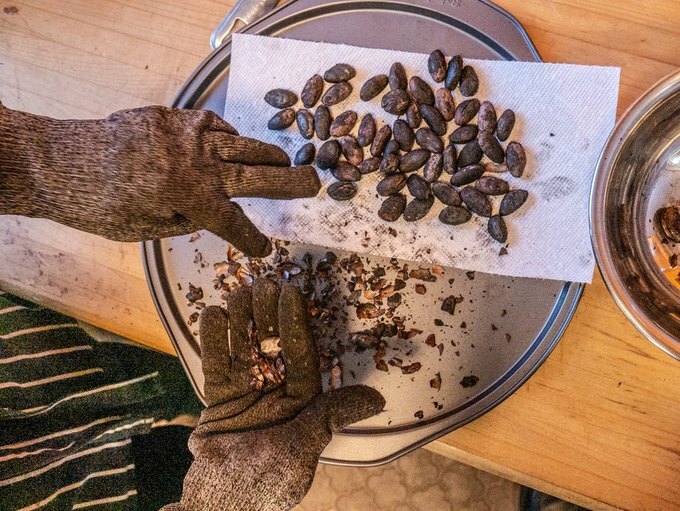 So together they begin the painstaking process by sifting through the 100-pound bags of beans they regularly order, picking each bean one-by-one to avoid the non-edible materials that get swept up: stones, metal wires, cloth ribbons, and a lot of dirt. Constantine likes to take a picture of all the garbage left over and post it to Instagram. The beans get scooped into about 15 bags. 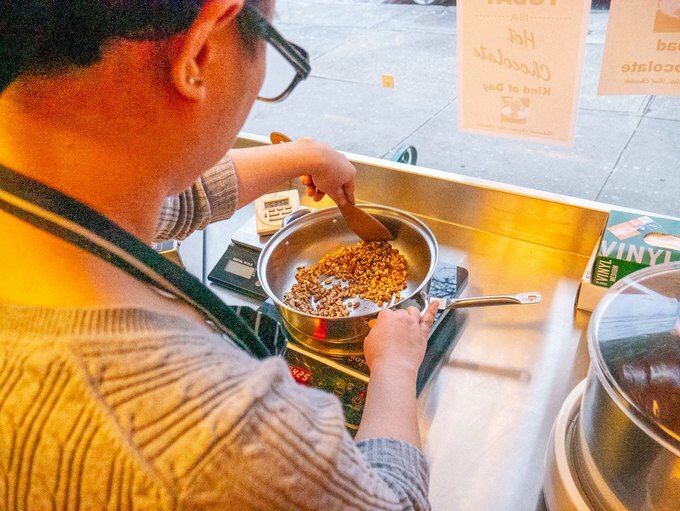 They’ll take a five-pound batch home and roast one pound at a time for 11 or 12 minutes each, depending on the size of the beans and its earlier fermentation process. Did you know, that the fermentation process is when the actual chocolate taste is developed? Without prompting, Constantine explained how the white pulp covering the cocoa beans is sweat out in the sun, after they’re picked from the tree to develop the flavors. While the beans cool down, Ruby begins to hand-shell them. One-by-one. Each pound takes about 40 minutes, she said, and the smaller ones sometimes take longer. It takes 37 beans to make one ounce of chocolate. She doesn’t listen to music, doesn’t watch TV while she shells — she likes to have full control, have her full attention so no shells make it into the mix. “When I cast my shadow on her doing her thing, she says, ‘Get outta the way!’” Constantine says, laughing, as sometimes he tends to tower above his petite wife. 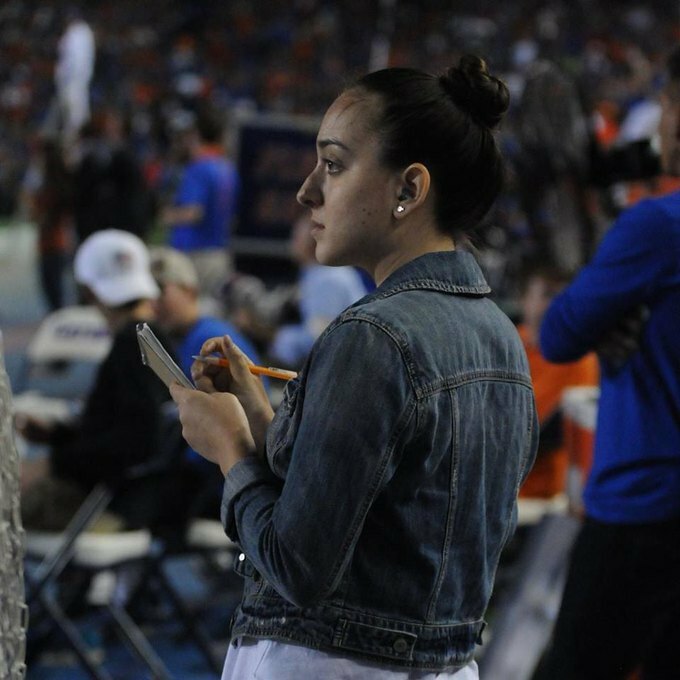 “I can tell you, it's very tedious to do. However, the reward is in the fact that entire bean is intact,” Constantine continued. His hands tend to shake, but he helps when he can. The next day, he brings the beans to the shop and crushes them before feeding them into the conching machine, which squeezes the cocoa particles into a paste. After about six hours, it will be as smooth as butter. Any longer would give way to oxidation. The chocolate goes into the tempering machine, which brings it to 108 degrees and back down to 87.9. Almost done, folks! The chocolate, which is mixed with natural cane sugar, gets poured into molds, which Ruby later pops out and scores with a knife, creating 1 ounce bars that are 70 percent dark chocolate. The other mold, 1.3 ounces, is for the melting chocolate, which is used to make the hot chocolate Ruby approves of. The hot chocolate disc is placed in an insulated stainless steel container, and 200 degree water is poured in. After 30 seconds with the hand mixer, you have a creamy, non-dairy treat. Three pucks go for $15. Ruby gets creative with the chocolate bars, mixing in different seasonings she has lying around to make new flavors. A 1 ounce gold-wrapped rectangle is sesame and flax seed. A blue-wrapped piece is a delightful chia seed. The red-wrapped one is cayenne, with a bold taste that lingers on the back of your tongue. The Szechuan peppercorn sounded too crazy to work — but it did. The small-but-mighty gems go for $5. Preparing additional toppings for the bars. For when the weather warms up (or for those who boldly carry iced coffee even in a polar vortex), they also make fruit popsicles. Selling, Constantine admits, was just as hard, if not harder, than making the chocolate. 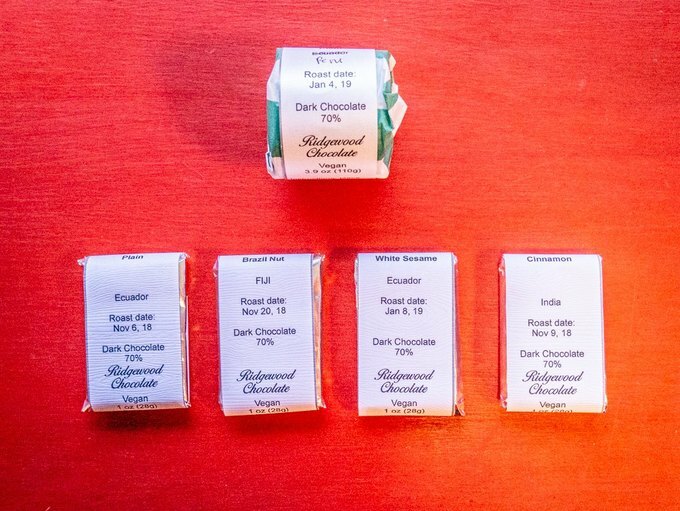 Each 3 ounce bar goes for $10 — but he’s confident the quality is worth $50. “We know too much [about chocolate],” Constantine said with all seriousness, after naming some of its properties and a few more “tidbits.” In their research, they learned chocolate is called “food of the gods,” and they treat it as such. The chocolate keeps them alert and happy. It’s more satisfying than selling tobacco, Constantine said, which they still do to keep the storefront afloat. But he hopes one day they won’t need to. Saturday 11 a.m. to 6 p.m. 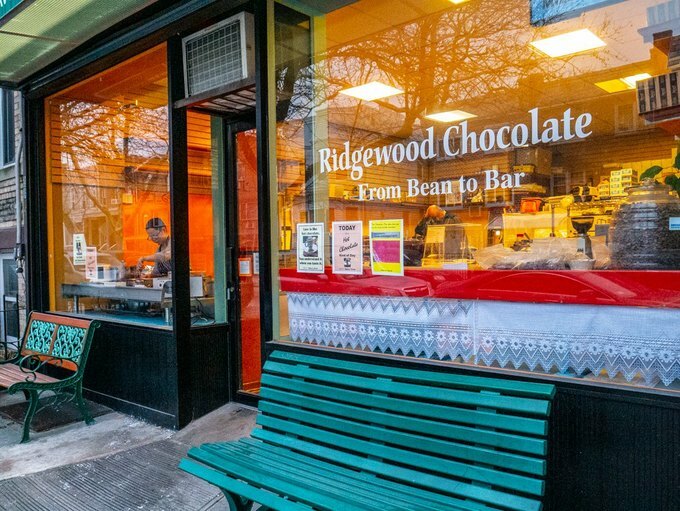 Follow Ridgewood Chocolate on Facebook and Instagram.